These are premium replacement Diode Dynamics 35w HID bulbs, from CNLight, the top brand in HID bulbs. The HID sizes offered come with standard connectors for use in an HID conversion kit. They do not include ballasts needed for full conversion of halogen lighting. These are for replacement of stock factory OEM HID bulbs, for vehicles with HIDs from the factory. This is not a conversion kit, for the conversion of halogen factory lights. Please purchase an HID Kit to convert your factory halogen headlamps into HID. Unlike most bulbs you will find online, Diode Dynamics bulbs are high-quality and will last for years to come. 2 Premium HID bulbs (1 pair) in your choice of color temperature. 3000K is the lowest temperature offered, and has a pure yellow output, which is great for use in fog lights or for a unique look. 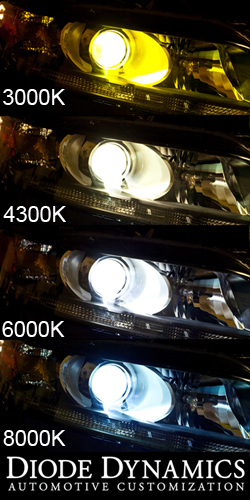 4300K is a pure white output, and is used in all factory HIDs. It will not have any blue tint, just a natural white color. 6000K is one of the most popular colors, which produces an ice white color. It has a slight hint of blue, and matches best with Diode Dynamics LED bulbs. 8000K is the highest temperature offered, which produces an ice blue color. Diode Dynamics uses only the highest quality HID bulbs. CNLight is the top manufacturer of aftermarket bulbs, providing the best quality available. Every premium supplier uses CNLight bulbs, although some label them as their own brand. The bulbs use a ceramic base whenever possible, to control heat properly. They have one-piece injected bases for additional durability and strength, and are constructed with much higher overall quality than most of the bulbs on the market. Warranty: Do not be fooled by overrated warranties from other manufacturers and distributors. The warranty is only as good as what the company actually replaces. The warranty is through Diode Dynamics, LLC, so you can be assured that you will get fast and friendly service should you have any problems. These bulbs carry a full 3-year warranty for any defects or problems with operation. Shipment: We carry our own inventory, so no waiting for them to be shipped from overseas, or waiting on big, unreliable suppliers to ship them. They ship right from our own inventory, in St. Louis, Missouri, within 24 hours of your order. What is the wattage and luminescence of these bulbs? These HIDs are meant to be used with 35W ballasts, and the output rating is about 3200 lumens! Would these work as a D2S xenon bulb replacement? And what would the lumens be? Our D2S HID replacement bulbs should work in any vehicle that comes with a factory D2S HID system. They will have a lumen output of 3200 lumens per bulb.